Alexander Grady Puckett (Heavener), Rubin (LHJ), Malox (DeVorkin), and Harry (Hegyes) are Vietnam vets from the local VA hospital, who are taken into the wilderness for a retreat. While there, an evil white supremacist, Mallerd (Glover) begins hunting them for sport. While in the midst of fighting for their lives as inadvertent pawns in this game of survival, Puckett gets separated from the group and runs into two women out camping. Rachel (Carson) and Libby (Brisebois) get to know him while he suffers from some kind of amnesia resulting from a fall. Thanks largely to Puckett’s skills as a smooth serenader, Rachel falls for him, and now he really has something to fight for. So, recalling his old ‘Nam training, and loading up with weaponry, Puckett goes after the baddies with a vengeance. But can he come back from the edge after going...KILL CRAZY? We’ve seen so many Heavener movies at this point, we feel like we know him. We’ve always been champions of his work, and as writer/director/musician/star, he shows he’s more talented than a lot of his action brethren. Kill Crazy, thankfully, rewards us for the vigil we’re always holding for Heavener. It’s got a good pace, plenty of worthwhile moments, and is enjoyable entertainment tailor-made for the video store patrons of the day. For a low-budget actioner, it’s hard to ask for much more. When the movie started we thought it was going to be a “Paintball Gone Wrong” (PGW), which we always look for, and the film as a whole does bear some similarities to the classic Master Blaster (1987), but then it becomes another Most Dangerous Game knockoff. But Heavener was able to tie in Vietnam vets into that scenario, which is at least somewhat original. 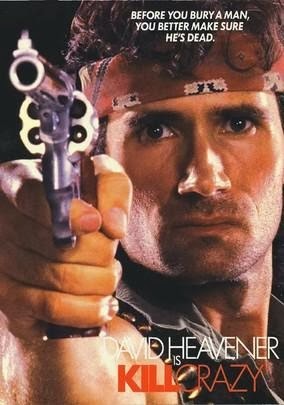 While it’s no Deadly Prey (1987), there’s plenty of pleasure to be had in watching Heavener take his revenge(ner). Plus his song, “Soldier On the Run”, prefigured his later tune, “Outlaw On the Run”. We can’t possibly accuse him of being out of ideas, as he generated more ideas than the normal B-movie star - you just have to know his style. Speaking of style, as stated earlier, his name in the movie is Alexander Grady Puckett. Evidently that’s such a great name, he wears a shirt that says the word “Puckett” in big letters across the chest. It even has some pins attached, but we couldn’t read what they say. In true 80’s tradition (yes, we know the movie was released in ‘90 - things don’t change that fast), there is the classic “comic relief fat guy”, this time named Malox. Fan favorite LHJ is also here, but his star would shine brighter in his PM outings. Other standbys dutifully included here are the scenes of torture, and Heavener getting needlessly shirtless. The funny moments, whether intentional or not, help keep Kill Crazy afloat, and, in actuality, make this one of the best Heavener movies we’ve seen to date. Released by the great VHS label Media, Kill Crazy is an experience we very much enjoyed. Would it be possible to post the reviewed movie's trailer, too? I know you guys are very diligent about uploading movie covers and reviews, but to have a visual frame of reference would help as well. If not, no biggie. Keep up the great work! Thanks! Appreciate the suggestion. We'll try to find the trailers from Youtube and embed them. Thanks! That's really nice of you to say that. We aim to please (and to kill like most of the movies we watch) Haha. The pinnacle of absolute rudeness. 1990 was the last great year known to mankind. Agreed. Before political correctness ruined our action movies. Haha. 1990-1995 still had some fun ones...any Lamas film.